ROSEMONT— Fresh off Associated Press top 20 wins over the Creighton Bluejays and the Butler Bulldogs last week, the Georgetown Hoyas (13-10, 4-6 Big East) have hit the reset button on what appeared to be a lost season. Behind Evanston native Rodney Pryor’s seventh straight game in double figures with 26 points in front of family and friends, the Hoyas continued the momentum with their third straight win in a 76-73 win at the DePaul Blue Demons (8-14, 1-8 Big East) in front of 5,455 fans at the Allstate Arena. DePaul coach Dave Leitao gave credit to Pryor's performance and put everything on the line in terms of its defensive strategy. Pryor’s spectacular tip-dunk highlighted the senior’s performance in Rosemont and provided a spark for Georgetown’s offense as it went on a 14-0 run, which lasted 5:14 and spanned both halves. Despite Pryor’s splendid performance, L.J. Peak delivered in the game’s final minute by converting the last five Georgetown points, highlighted by a driving layup with 13 seconds left to finish with 13 points. Saddled with foul trouble for the majority of game, Peak could not get into a rhythm until late and Georgetown coach John Thompson III admitted the shortcomings, but proud of determination in the final minute. "(L.J.) had a frustrating game because he was in foul trouble and could not get into the flow of things," Thompson III said. "However, L.J. Peak did what L.J. Peak does in the end." 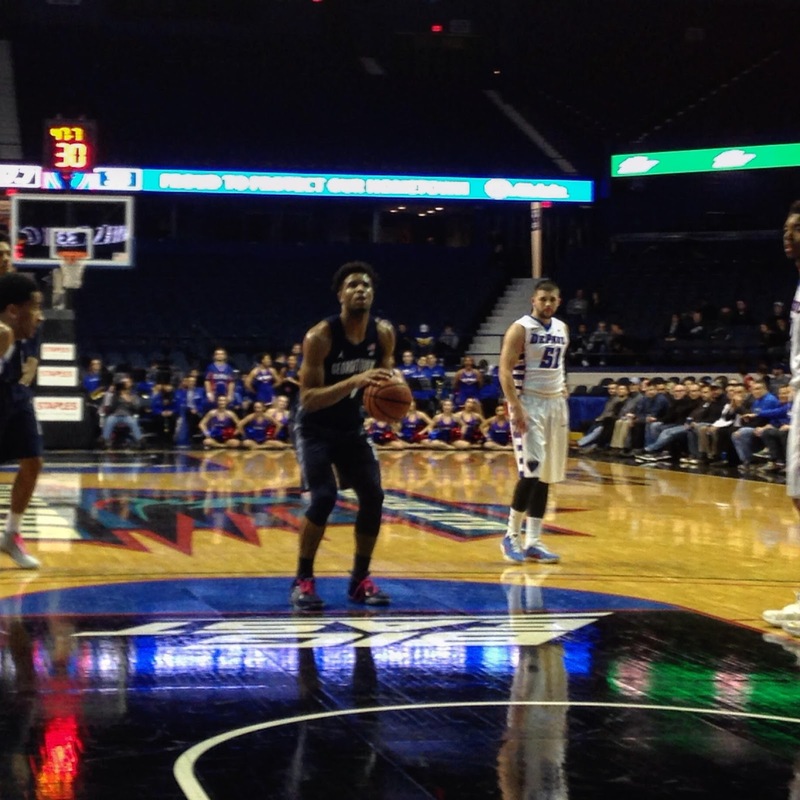 While the offense went through Billy Garrett Jr. with a team-high 25 points, DePaul's leading scorer Eli Cain added 19 points and six rebounds. The Hoyas came out on fire in the first 105 seconds of the game on a 10-0 run and going 4-for-4 in the frame. Leitao called timeout to settle the Blue Demons down and worked as they responded with timely shots from Joe Hanel and Garrett Jr. to highlight a 9-0 run over 3:26. The pace slowed down and played more into Georgetown’s half court pace with its signature Princeton offense and led at 18-17 until Brandon Cyrus’ layup halfway through the first half for DePaul. The Blue Demons’ led for all but 1:40 until the Hoyas took the lead once more, highlighted by a Pryor two-handed dunk and a three-pointer from the wing. However, an unexpected boost from freshman Al Eichelberger off the bench helped give DePaul its biggest lead of the half at 33-27. The Hoyas had other plans as they countered with a 13-0 run and remained in control. Cain continued to struggle to find his jump shot as he missed a combination of open and contested jumpers. At the under-11 mark and in need of a spark, DePaul turned to Cain, who was 3-of-13 from the field before two straight field goal conversions and a free throw to make to cap a 9-2 run to notch things at 52. Cain continued the momentum shift with a long-range make to give DePaul its first lead of the second half, but Pryor responded on the other end with a triple. Refusing to be outshined, Cain drove back down on to make another three-pointer as a duel commenced. At the 4:42 mark, Garrett Jr. converted his 529th and 530th free throws and passed Stephen Howard for the top spot on DePaul’s all-time career free throws made list. 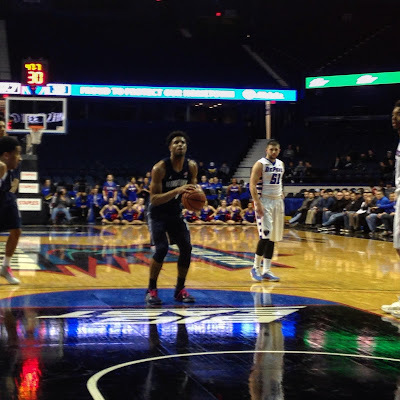 Despite the accomplishment, DePaul trailed 67-64, but Chris Harrison-Docks’ timely triple from the key and Garrett’s conventional three-point play, put Georgetown back on its heels with a three-point deficit. Both teams traded baskets into the final minute as GU clung to a one-point lead. Peak dribbled the ball as the shot clock ran down and drove right through the DePaul defense for the layup to put the Hoyas up three with 13 seconds left. Both teams return to action at home on Feb. 4 as the Hoyas look for their fourth straight win as they play the Seton Hall Pirates and the Blue Demons meet longtime rivals, the Marquette Golden Eagles.